While there are many theoretical risks associated with IVF, here we will focus on four: ovarian hyperstimulation syndrome (OHSS), issues associated with twins or triplet pregnancies, birth defects in offspring, and women developing cancer after undergoing IVF. Generally speaking, it seems reasonably clear that IVF increases the risk of OHSS and multiple pregnancies. But that doesn’t have to be the case, and treatment can actually be adjusted to nearly eliminate these risks. As for birth defects within the children who result from IVF, it appears that IVF increases the risk, especially for boys, but the absolute increase is small and there are plausible (but not bulletproof) ways to mitigate the risk. As for breast and ovarian cancer, it’s difficult to conclude whether the underlying infertility itself, or the IVF treatment, drives higher rates of cancer. Generally speaking, recent studies have been reassuring and pointed to the infertility, rather than IVF, as the causal factor. What’s more, the absolute incidence of both breast and ovarian cancers amongst IVF patients is low. However, whether IVF drives higher rates of cancer is unresolved and requires more study. Given the complexity of the answer, we may never arrive at a definitive conclusion. As always, be sure to have a thorough discussion with your doctor on each of these subjects. Your circumstances may well be unique and require a deeper conversation. Most IVF patients are given gonadotropins to stimulate their ovaries to produce an abnormally high number of follicles (that house eggs) and a “trigger shot” to ensure the doctor can remove mature eggs from the follicles during retrieval. Women who have been “overstimulated” with gonadotropin may develop Ovarian Hyperstimulation Syndrome or OHSS. OHSS symptoms include pain, nausea, dizziness, vomiting, hospitalization, organ failure or worse. OHSS occurs in 1 - 10% of IVF patients, but that’s an average — amongst certain demographics (like younger women, women with PCOS, or those with a high AMH) the risk and incidence is higher. OHSS is preventable and for it to transpire, two things must occur. First, a woman must receive more gonadotropin than her body can handle, and this manifests itself in the fast growth of a high number of follicles or especially high estrogen levels. If this unfolds, the cycle can be stopped and OHSS can be avoided. Even if a woman is overstimulated and continues treatment, if she takes Lupron (instead of hCG) as her trigger, OHSS can be largely avoided. 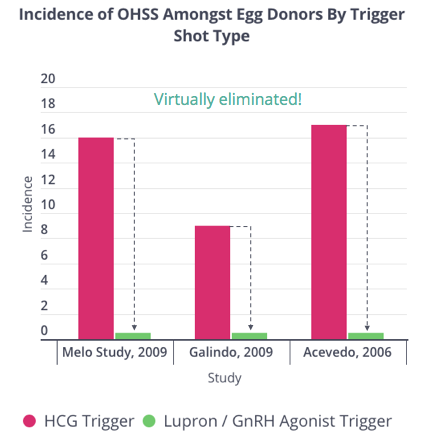 A powerful example of this comes from three studies of women freezing their eggs showing that when Lupron is used as a trigger, OHSS is virtually eliminated. However, a Lupron trigger can only be used with an “Antagonist” protocol which must be agreed to at the outset of the cycle. Doses can be changed during a cycle, but protocols can’t be. When multiple embryos are transferred, the risks that an IVF pregnancy results in a multiple gestation birth rise from 1% to as high as 30%. This results in greater risk to the mother and to the offspring, as you can see in three excellent studies below. Twins and triplets are more likely to be born prematurely, possibly missing out on a period of in-utero development critical for grey matter development in the brain. 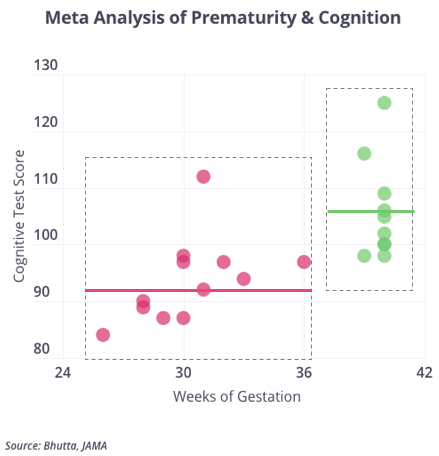 As a result, prematurity has been associated with lower cognitive function as you can see in analysis that appeared in the Journal of The American Medical Association. Much of this risk can be mitigated by transferring one embryo per transfer. While this may increase the odds the first transfer doesn’t work (requiring an additional transfer, costing $3,000 per transfer), it doesn’t lower the odds the IVF cycle itself will lead to a live birth (a cycle starts when a woman does stimulation ahead of a retrieval). This is a difficult subject to study and summarize for two reasons. First, the definition of “birth defects” vary by type and the age of the offspring. Second, IVF patients often have fertility issues, and by definition are different from the general population. As a result, any difference in the rates of birth defects in offspring could be on account of the factors that produced infertility in the first place, the IVF process itself, or even another factor. It can be difficult to disentangle these possible factors. Generally speaking, 1 - 3% of babies born in the general population suffer from some birth defect. When a couple has had trouble conceiving, that rate climbs to 3 - 5%. This is best evidenced by one large Finnish registry that includes nearly 30,000 offspring. 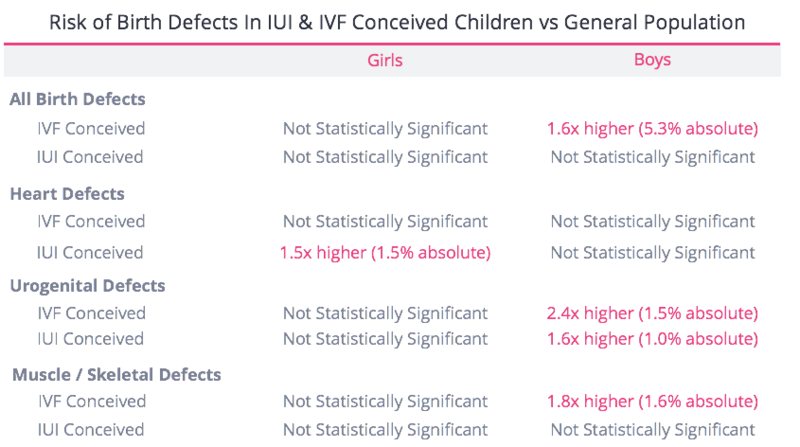 Amongst the groups needing fertility assistance (using ovulation induction, IUI, or IVF), those requiring IVF were more likely to produce a child with a birth defect, but, as you can see below, the absolute difference is rather small. When we look more closely at the Finnish data, amongst singleton births, in many categories children born from any type of fertility treatment (not just IVF) are more likely to have a birth defect than those conceived naturally. But that does not get IVF off the hook necessarily. As you can see below, babies born from IVF do have more issues than those born from IUI or ovulation induction, especially boys. That said, one should keep straight the difference between “relative” and “absolute” risk here. In the example below, boys born from IVF are 1.6x more likely on a relative basis to have a birth defect compared to boys in the general population. 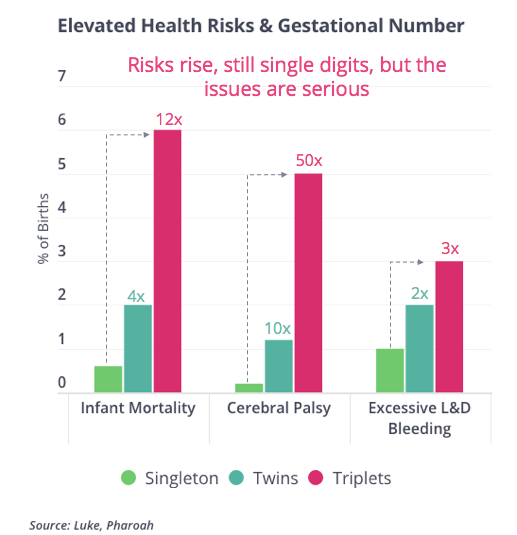 But since the odds of that happening in the general population are low (~3%), the absolute risk of of boys born from IVF developing a birth defects is only about 5%. Deploying more single embryo transfer, as babies born from multiple gestation pregnancies are more likely to encounter physical and cognitive challenges. Only using ICSI as a fertilization technique when absolutely necessary. As one large New England Journal of Medicine study showed, the incidence of birth defects is lower when conventional insemination is deployed. However, a confounder in the data is that those IVF patients who required ICSI may be different than those who used conventional insemination (namely, having a severe male factor infertility issue). Today, the field is chiefly focused on determining whether women undergoing IVF are at greater risk for developing breast cancer or ovarian cancer. Ultimately, it appears the subject needs more research, but the research has generally (but not universally) been reassuring. This subject is difficult to study for two reasons. First, when trying to isolate whether IVF is the cause of cancer, researchers need to make sure the populations they are comparing are the same. That way any difference in outcomes can be attributed to the IVF and not some other factor. Generally speaking, that has not happened, as investigators have compared populations that have not needed IVF (fertile populations) with those that have needed it (infertile populations). As a result, it can be difficult to discern whether the treatment, or the differing populations, account for any difference in cancer rates. This is especially important because it has been shown that being infertile in and of itself correlates with developing cancer. Second, cancer is an uncommon occurrence and so it requires tracking large volumes of patients, over many decades, to detect any difference in cancer rates. This often means relying on historical datasets and registries, which are less effective at revealing answers than a prospective, randomized study. As you read our rundown of both types of cancer, keep in mind the likelihood a woman develops either form of cancer is often in the single digit percentages. Hence an increased “relative risk” associated with IVF, let’s say of 1.5x, might shift the odds of developing cancer from 2% to 3% or 4% to 6%, conferring a single digit absolute increase in risk. It’s unclear whether taking fertility drugs, specifically gonadotropins, increases a woman’s risk of developing breast cancer. As you can see below, Reigstad’s 2014 investigation compared breast cancer rates of women undergoing IVF with the general population. 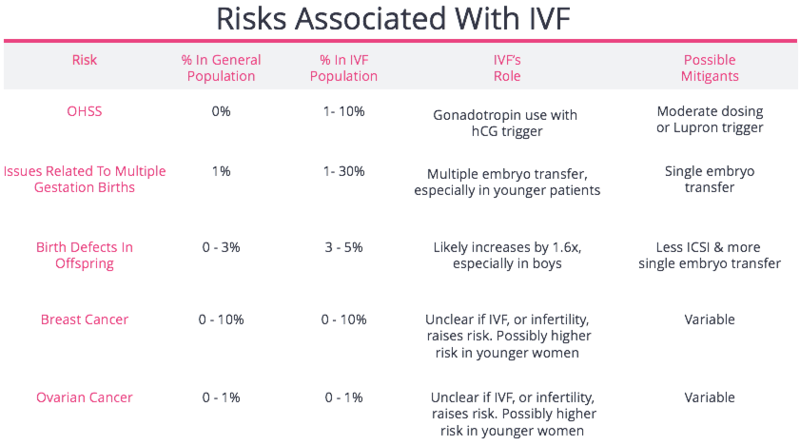 The study showed women subjected to IVF had an increased cancer risk (though it doesn’t look like it when you look at the risk numbers below because those figures to adjust for differing populations). However, a meta-analysis of multiple studies by Sergentanis came to a different conclusion (though it found potential pockets of risk amongst younger patients). Probably the most extensive work (Sutcliffe) was published in 2018 on over 200,000 IVF patients with an average 10 year follow-up. The investigators saw no increased risk compared to the general population for breast cancer generally, but a slightly higher risk for in-situ breast cancer (often localized in the milk duct). If there’s indeed a correlation between IVF and breast cancer, there’s data to suggest the underlying fertility challenges themselves, and not necessarily the use of hormonal stimulation, might be a factor. As you can see in the chart below, Belt-Dusebout, Lindberg, Stewart and Zreik determined that rates of breast cancer were similar amongst an infertile population regardless of whether they were given fertility drugs or not. What’s more, Belt-Dusebout’s study showed no correlation between the amount of drugs given and rates of breast cancer. However, there were some interesting observations along the theme of age. Some studies point to undergoing IVF at a younger age as being riskier, while others have found being treated at older ages is riskier. Lastly, when looking for patterns of breast cancer amongst those who underwent IVF, it appears those who conceive with twins record a slightly higher rate of developing breast cancer. The largest study on the subject was conducted in the UK and came to the conclusion that women who underwent IVF had a small, but elevated, risk of developing ovarian cancer (0.2%) compared with women in the general population (0.1%). However, the increased risk was isolated to women who had a fertility issue. Women who underwent IVF with no fertility issue (when the only issue resided with the man) recorded no higher rates of developing ovarian cancer than women in the general population. The implication is that when no female fertility issue is present, IVF does not cause ovarian cancer. However, rates of ovarian cancer are indeed higher amongst women who do IVF due to a female fertility issue compared to women in the general population. This lends credence to the notion that the underlying fertility issue may be the culprit because as we saw above, fertile women who undergo IVF aren’t at greater risk. It appears that younger IVF patients are more likely to develop ovarian cancer than similarly aged women who do not undergo IVF. However, as you can see below, the absolute odds of developing ovarian cancer regardless of age bracket or source of infertility, is small. 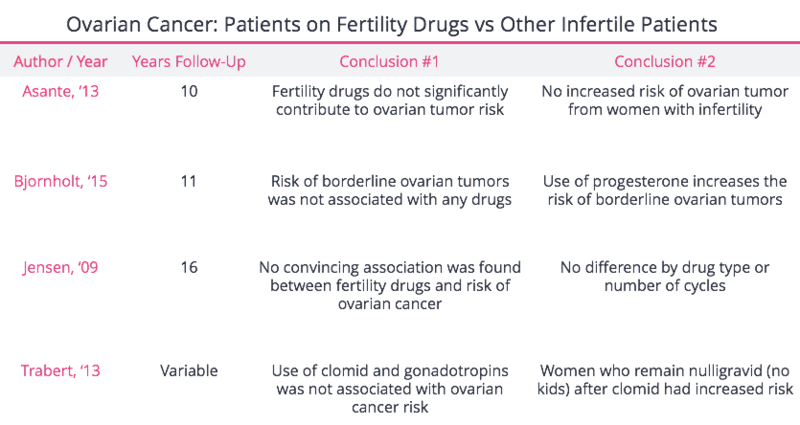 Over the last 30 years investigators have sought to remove the confounder of “infertility” to determine whether fertility drugs cause higher rates of ovarian cancer. Small studies in the early 1990s led investigators to believe the fertility drugs themselves drove a higher risk, but in the last decade a series of larger studies from Asante, Bjornholt, and Jensen have recorded that the fertility drugs themselves likely caused no higher risk. Just as is the case with breast cancer, most investigators conclude both issues require more study.